Winkflash has photo cards and personalized stationery for any celebration or milestone throughout the year. From custom wedding invitations online to personalized thank you notes, we have a large variety of templates available for a range of holidays and events. Just add your favorite photos and text for truly personalized look! If cardstock is what you’re looking for, our 5×7 folded cards are another great option for creating your own custom greeting, announcement or invitation. Winkflash offers you custom printed greetings that you can design with your most treasured memories. 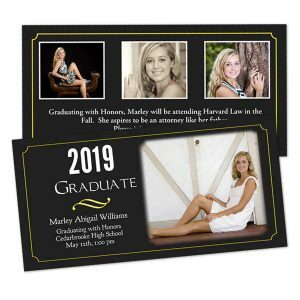 Why should your graduation announcements be any different? Pick out multiple photos from your phone or upload a senior portrait to get your graduation photo cards started. Our online card maker is easy to use so you can complete your greetings in minutes. We also offer custom printed Graduation gifts too! Order personalized mugs, office accessories and more to create the perfect keepsake that celebrates this special time in your grad’s life! Let Mom know just how special she is to you by creating a one of a kind Mother’s Day card that features her most cherished photographic moments! Our card stock cards can be printed on both sides with pictures, a personal message, or even your own artwork! Choose from several templates or start your own scratch with our blank card layout option! Just like Mom, you can design the perfect photo Father’s Day card for Dad. Select your photos and choose from one of our many stylish templates to showcase your pictures. Then, add your own personal message to show him how much your care. When it comes to designing the perfect card for Dad this Father’s Day, Winkflash will not disappoint. Now that you’ve taken care of your custom greeting, we also have a wide range of cheap Father’s Day gifts that you can design yourself. Use his favorite photos to create a personalized neck tie or make a Father’s Day photo book that shows off his best memories on page layouts that you design from scratch. 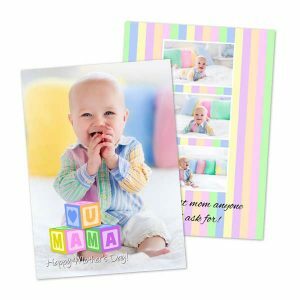 With your own photos and text as well as a variety of stylish templates and backgrounds, you can design the perfect card stock cards with ease. Just gather your photos and get creative. In no time, you’ll have your very own card design ready for ordering. First, upload your photos to Winkflash directly from your computer. Afterwards, select your card size and choose your orientation. Then, pick from our multitude of styles and templates to fit the occasion. Using the project builder, simply drop your photos onto your layout and then add your own text. Finally, review your card layout and then place your order. After receiving your order, you can hand write your own message and send them out to loved ones for any occasion, whether it’s a holiday greeting, a birthday party invitation or even a thank you card. Whatever your needs, Winkflash has dozens of customized options that will allow you to design the perfect card. Have you ever thought about making your own postcards? Custom postcards can be sent out to friends and family year round and will add a unique twist to your personalized greeting. Upload your own photo to Winkflash and add it to your double sided card layout. Display a collage of your favorite family snapshots or a landscape photo from your day trip for a unique postcard that everyone will admire. Postcards are a fun way to keep up with loved ones during the holidays or even just a simple “hello” any time of year. Print photos on cardstock to create custom save the dates with a professional look. Whether you’ve made plans for your wedding day or you want to remind everyone of your baby shower, save the date postcards are a great way to keep family and friends updated on future parties and events. Photos add a unique touch to any greeting no matter the occasion and weddings are no exception. Create your own wedding invitation cards or your won wedding thank you postcards with our double sided photo cards. Both front and back can be designed with a collection of engagement photos and your own stylish text for the perfect announcement. We have several designer styled templates that are sure to fit the bill. Are you looking for a unique way to show a little gratitude to a loved one for a special deed or a treasured gift? Maybe you want to send out thank you notes to show how appreciative you are of your wonderful Christmas gifts. Why not design your own thank you cards that include your favorite photo and a personalized message that everyone is sure to enjoy. We offer several thank you templates that will compliment any taste or style that your loved ones will simply love. Our personalized text tool can be used to create your own monogrammed cards. Design your own double sided stationery cards with a favorite photo and monogram for any greeting, announcement or invitation. All of our cardstock photo greeting cards arrive at your door with complimentary envelopes so they can be sent out with ease. Create an area on the back to hand write you own personal message and you’ll have a thoughtful, unique greeting that gives your greeting a special flair that can’t be beat. If you’re looking to design your own announcements, we have various templates that are perfect for several different occasions. Adding your own photo to your customized announcements will give them a personalized flair. Maybe you just added a new member to your family and you want to create your own baby announcements. Choose from multiple new baby announcement templates and print a photo of your little one to create a stunning card that all of your friends and family will adore. If you are currently planning your wedding and have decided on a date, you can upload a photo to Winkflash and create an elegant wedding announcement that includes an engagement photo as well your own text detailing your upcoming wedding plans. Choose from various stylish backgrounds to fit your wedding’s theme and style. Maybe you’ve just settled into your new home and you want to send your loved ones a note with your new address. Why not create your own customized moving announcements that show off a photo of your family with your new home. Use our text feature to include your new address and a personalized message to keep your loved ones apprised of your new digs. Select from a variety of elegant card layouts that are sure to give your announcements that stylish look. Whether you’re planning your wedding, just had a baby or are moving into a new home, Winkflash has the perfect double sided card just for you! If you are looking to create a set of stationery cards that is perfect for any occasion, check out our collection of all occasion cards that can be personalized to your liking. Choose your double sided card size and add a favorite photo that will show off your personality in style. Use the back of your cards to write your own message and send them out any time, for occasions both formal and casual. Our templates are available in dozens of color schemes and designs that will fit your unique style to a “T”. Create your own set of stationery with our double sided photo cards! Using your favorite photo and little creativity, you can create personalized cards that you can send out all year long. Each greeting is made from durable card stock for a professional look. Choose a template appropriate for your occasion and send your friends and family a little love with an elegant flair. Whether it’s a simple greeting, an invitation or two sided photo Christmas cards, you can design it in minutes using our online card maker. Upload your photos to Winkflash and get creative today!